Archivist discovers a piece of her Joint connection at home. Long before I started working at JDC, my grandmother, Lore Weintraub (nee Simberg) and my great-grandmother, Rosa Simberg (nee Drector), were two of many Holocaust survivors who came to the United States with the help of the Joint. As an archivist at JDC and one of the editors of the Archives eNews I have been privileged to come across many stories of individuals, both members of the public and JDC staff, who found their JDC connection in the Archives. A budding genealogist myself, I thought I would try my hand at looking into this unverified fact in my family’s history using JDC’s Names Index. To my surprise, I found nothing. I was especially frustrated, as I had previously found a ship’s manifest with the word “Joint” printed next to my grandmother and great-grandmother’s names. On top of that, I was also told that my great-grandmother had worked for the Joint in Berlin after the War and had a photograph to prove it. Many years before my hiring, though, my grandmother, great-grandmother, and great-grandfather, Isidor Simberg, suffered through the most harrowing years of their lives. Forced to leave their small town of Bruschen in East Prussia (known as Kiesfelde in the late 1930s and currently located in Russia), where they were the only Jewish family in residence, they made their way to Berlin. In January of 1942, they were transported to the Riga Ghetto where, tragically, my great-grandfather was taken from his family and never seen again. Miraculously, my Grandma Lore and her mother managed to stay together through three concentration camps (Riga-Kaiserwald, Riga-Strasdenhof, and Stutthof) before they were abandoned by the Nazis on a forced death march in Poland. After the war, they returned to Berlin – my great-grandmother working for the Joint while my grandmother, according to her Spielberg testimony, chose to work elsewhere. On November 13, 1947, they sailed on the SS Marine Tiger to the United States, settling in Philadelphia. A few years later my grandmother met my grandfather, Ben Weintraub, also a Holocaust survivor. They married, moved to the Bronx, and set up a clothing store on the Lower East Side. 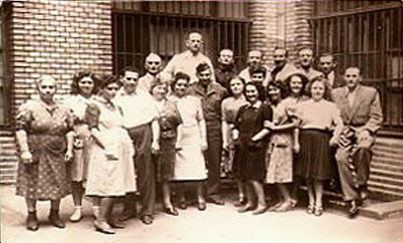 My great-grandmother, Rosa, is standing on the far left. Do you recognize anyone in this photo? 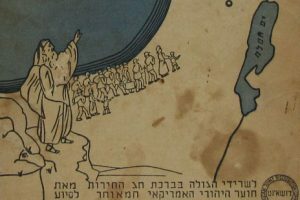 Fast forward seventy years and I’m sitting at home with my father this Passover, going through old family photos and documents. As I was sifting through my grandparents’ love letters, my dad’s old yearbooks, and our family photos, I kept thinking to myself, “Wouldn’t it be funny if I finally found something JDC related?” Less than two minutes later, I found two cards with the letters A.J.D.C. printed at the top. 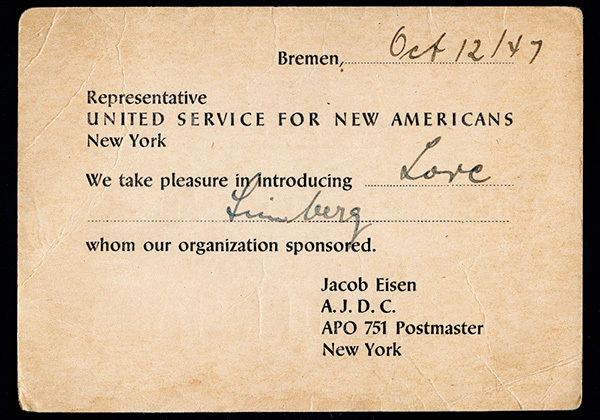 The cards served as JDC representative Jacob Eisen’s way of introducing my grandmother and great-grandmother (and countless other immigrants) to the United Service for New Americans – the major immigration and resettlement organization in the United States for Jewish displaced persons immigrating in the late 1940s and early 1950s. In addition to those cards I also found their passenger tickets for the SS Marine Tiger with the words “Joint” scribbled towards the bottom, which confirms what I saw on the ship’s manifest. Perhaps it sounds dramatic to say that I was emotional and overcome when I found these items, but it’s true. I finally found proof of that connection that I’d been longing for. I am so incredibly proud that I get to give back to the organization that gave life back to my grandmother and her mother and ensured that I’m here writing this post all these years later. The JDC will forever and always be a part of my life and I am eternally grateful. Rebecca Weintraub is a Processing Archivist at the JDC Archives. This story has been shared with her permission.